Please don’t get upset if you have a very utterly mortifying report on the average talent you have in your country now in terms of global youngsters. Bangladesh ranked 118 out of 125 countries in 2019 based on the quality of talent it retains, develops and attracts according to the Global Talent Competitiveness Index (GTCI). To understand the real picture of global talent INSEAD with Tata communications and Adecco Group discloses the ranking among the nations every year where the frustrating picture is still sticking on with no progress. Last year, it ranked 114 among 119 nations in the index; that means Bangladesh has been consecutively among the bottom 10 while some countries are significantly improving. GTCI is preparing the position of the nations concerned on the basis of 68 variables including the entrepreneurial talent and the courage, especially how they acquire the ability to address the ensuing challenges. Even except the given indicator, average talent for Bangladeshi people has been in a serious question. To mention, quality education in particular is the driving power of development and it creates sense of duty. It definitely ensures intellectual, social, economic, cultural, political and moral development. Very simply, how far a nation has progressed solely depends on the quality of students the nation have. So, the development is entirely dependent on education, particularly the environment within which people intend to make arrangement for. I am not sure enough Bangladesh is tracking out the genuine way. The nation fails to introduce a comprehensive way of education for all that can confidently ensure a brilliant generation. Does Bangladesh lack genuine talent? I have no hesitation to confess that Bangladesh is genuinely lagging behind in quality of education and thus a frustrating picture is all over. Quality education creates talent that has two different aspects: skilled manpower and genuine creativity. Unfortunately, both of the aspects are very poorly prevalent in the country. To compete with the fast challenging job market skilled manpower is seriously demanded and this happens also to the domestic job situation. Very few students have been equipped with diverse professional knowledge and also the culture of innovation. The traditional way of education system in the country doesn’t definitely confirm skilled manpower. Even, it neither assures to provide basic skill by which people can survive by themselves. Obviously, the question comes, don’t we need to have quality education to improve the state of talent we presently have? You needn’t go far to assess your children in the classroom and elsewhere where you must find the worst kind of performance at almost every level. 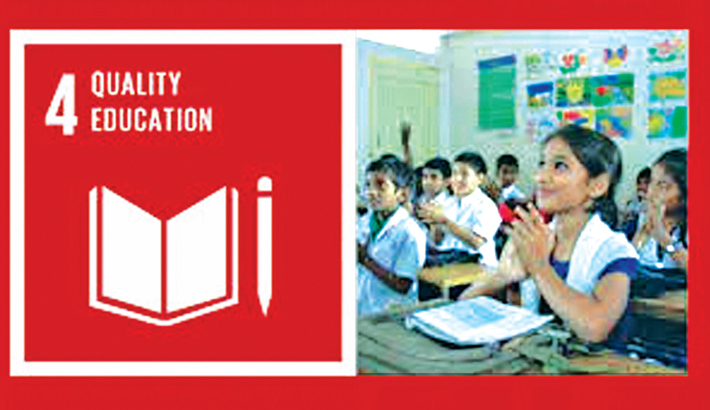 Literacy rate in Bangladesh has significantly progressed, drop-out rate has been remarkably reduced, and girl child enrolment in elementary learning has been noticeably accelerated since the last decade. You will find huge numbers of students are bagging up with their notorious GPA-5 as the highest credit. The number of the highest grade achievers is increasing and the madness for that target has reached an intolerable level. Guardians are wandering from one coaching centre to another; house tutors have been on serious pressure and under regular vigilance. The level of satisfaction thus never conforms to the demand of society. As a result, the appalling GPA-5 myth pulls everything down and creates a sense of horror in the society. But we are dismayed at the news when those brilliant students are found to be extremely poor in admission test at university level. This is one side of the frustrating aspects of our education. On the other hand, Bangladesh has also been struggling due to poverty of critical knowledge and its dissemination. This is appalling for a nation. University education and its research programme to create new knowledge have been in dire straits. To be sure, I believe, very few books had been written so far in Bangladesh that truly adds to the main stream of knowledge and very little research work has been done in the country that can be globally extolled. What is being produced everywhere in the name of research work is simply pointless and, truly, no damage would have been counted if nothing of the sort had been produced! Most of the works at the highest level of education are simply expository and trivial. This is substantially pitiable which is explicitly reflected on the above ranking. Educationists are desperately envisaging the need to make the change of the present day education system. Education from the elementary to the highest level has been at an unsatisfactory state. The traditional and uncreative way of learning has been dominating in all the phases of education. In the name of increasing creativity of learners, serious burden has been unduly imposed on the fresher. To get maximum grade point from the so-called public examinations, authorities concerned, especially guardians, are intolerably out to bump off their child. This unholy competition pushes the generation down; as the result, target of education has been seriously compromised. Huge number of students are flocking up every year and exerting pressure on the job market. The National University, the biggest in purview, has now been turned into a selling centre of certificates that virtually serve nothing. I had some personal experiences where I could find that number of quality books, number of teachers both in quantity and quality, opportunities, and environment are precariously absent in different colleges. The most damaging side of college higher education is that students don’t have any acquaintance with their subject or very little with their curriculum. Correspondingly, environment at universities is neither better off, I can assure. If you have opportunity to visit the central library of Dhaka University, you may find that many important books remain untouched for decades or so. Its back page records confirm you that some books and periodicals are withdrawn by teachers or researchers not more than one time in the last nearly hundred years! I can also confirm you that very few students there are reading books; what you can find is that students are organising cluster reading for only competitive examinations like BCS or others. National public library has also seen with the same picture. To define quality education, the World Bank prescribes certain quality of learners by which they must be able to compete with the global competitors or the domestic abler. This is simply an ability to acquire the cash value of education; but education demands more. It is not that education can help you to survive only but it invokes knowledge and wisdom that helps to change your world view. Knowledge has an intrinsic value that substantially diminishes darkness of mind and it progresses with the help of human’s constant effort. And, quality education only assures creativity of learners. Bangladesh must think and look forward to be a creative nation. This can only be possible when we can give value to knowledge and a society based on knowledge. The writer is Professor and Chairperson, Dept of Philosophy, Jagannath University, Dhaka.